Squilliam: Sounds like you've got a dying animal to attend to, eh ol' chum? Squidward: (gasps) Squilliam Fancyson from band class? Squilliam: It's big and valuable. 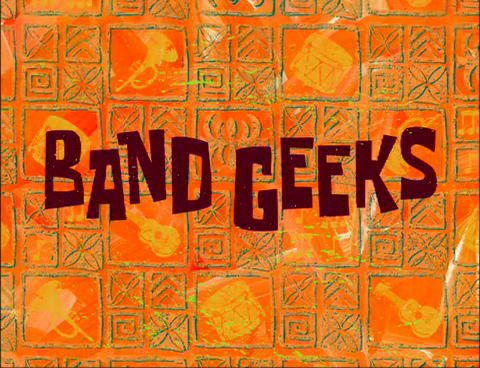 I'm the leader of a big fancy band now, and we're suppose to play the bubble bowl next week. Squilliam: That's right. I'm living your dreams Squidward. The problem is, I'm busy next week and can't make it. So, I was hoping you and your band could cover for us. Squilliam: I knew it. You don't even have a band. Well, I'll just let you get back to the service industry now. Squidward: Hold it! It just so happens that I don't sell fast food, I do have a band, and we're going to play that Bubble Bowl. How do you like that, Fancyboy? Squidward: I've got to drum up a marching band fast. Drum...haha...band humor. Mrs Puff: And be forever adored by thousands of people you don't know. Mr Krabs: Not to mention free refreshments. Squidward: People, people, settle down. Ok, now. How many of you have played musical instruments before? Patrick: Is mayonnaise an instruments? Mr Krabs: When do we get the free food? Squidward: Ok, try to repeat after me. (Squidward plays 5 notes) Brass section, go. (brass section repeats) Good. Now the wind. (wind section repeats) And the drums. (drums blow on their sticks which blow out and stick Squidward to the wall) Too bad that didn't kill me. Let's just try stepping in rhythm. Now I want everyone to stand in straight rows of five. Spongebob: Is this the part where we start kicking. Squidward: How's the harmonica playing go, Plankton? Squidward: Well, this is our last night together before the show. And I know that you haven't improved since we began... (Patrick chews on a trumpet) ...but I have a theory. People talk loud when they wanna act smart, right? Squidward: So, if we play loud, people might think we're good. Everybody ready? And a one, and a two, and a one, two, three, four... (windows break and Squidwards face is deformed) Ok, new theory. Maybe we should play so quietly, no one can hear us. Band Member #1: Well, maybe we wouldn't sound so bad if some people didn't try to play with big, meaty claws. Mr Krabs: What did you say, punk? Band Member #1: Big, meaty claws. Mr Krabs: Well, these claws ain't just for attracting mates. Band Member #1: Bring it on, ol' man. Bring it on. Spongebob: No, people. Let's be smart and bring it off. Squidward: Well, you did it. You took my one chance at happiness and crushed it. Crushed it into little tiny, bite-size pieces. I really had expected better of you people. I guess I'm a loser for that, too. Don't bother showing up tomorrow. I'll just tell them you all died in a marching accident. So, thanks, thanks for nothing. Spongebob: What kind of monsters are we? That poor creature came to us in his hour of need, and we failed him. Squidward's always been there for us when it was convenient for him. Evelin, when your little Jimmy was trapped in a fire, who rescued him? Spongebob: And Larry, when your heart gave out from all those canning pills, who revived you? Band Member #1: Yeah, for the firemen! Spongebob: Now let's make Squidward proud. A 1, a 2, a skiddleydiddleydoo. Squidward: I knew this was going to happen. They're just going to have to find another band to play. I just hope that... (sees Squilliam) ...Squilliam doesn't find out! Squilliam!! Ah! What are you doing here? Squilliam: (laughs) I just wanted to watch you blow it. So, where's your band? Squidward: Um, they couldn't come. They...died. Squidward: AH! That would be my band! Squidward: Well, I guess this will be the last time I can show my face in this town. Spongebob: Maybe we're in those toxic waste dumps. Mr Krabs: I think I'm gonna be sick. Squidward: Ok, everybody. Let's get this over with. 1, 2, 3, 4.